Today I went on a one-day pastels workshop with Julie Sylvester. I haven’t used pastels before and I am not a painter so this really was new challenge for me. Julie specialises in beach /ocean scenes and participants were asked to bring our own images to use as our inspiration. Of course being different I decided I didn’t want to do a beach scene so instead I picked an image from the Hubble Telescope. Space images fascinate me; the colours are often enhanced through different spectrums but the shapes, brilliance and colours are quite amazing. I have a couple of books on space and one specifically on the Hubble telescope. Instead of working on paper Julie uses picture framing mat board and paints the wrong side (which is acid free), with pastels primer in random brush strokes. This produces a sandpaper like surface texture which grabs on to the pastel really well. The pastel also washes off or rubs off easily so mistakes can be erased. The first stage was to block in the background using just a few colours to form the main areas of different tones – so light, dark and mid-tone areas. Then the colours are built up from back to front to give layers of depth. 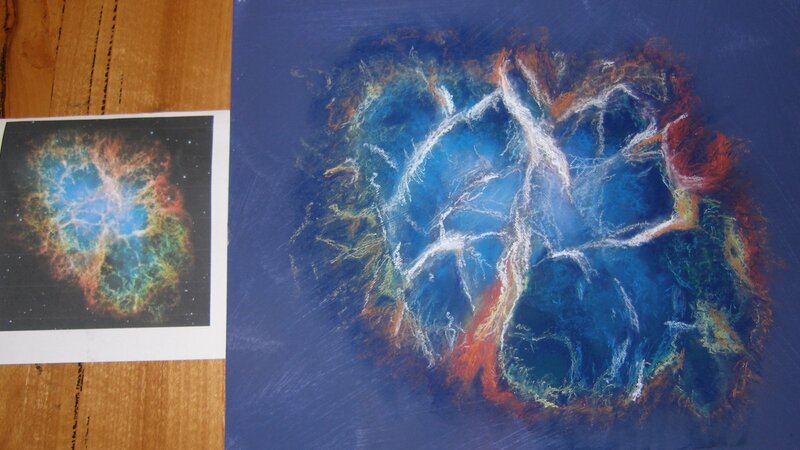 For my painting I made the background layers quite smudgy to get the smoke like effect in the nebula photo; this was achieved by running the pastel sticks lightly over the surface and smudging them with my fingers, building up colours and depth. As I got to the top layers I made the pastel strokes firmer to produce lines with the edge of the sticks. I found that after adding the lighter colours and highlights I then needed to work back over some areas with the edge of a very dark blue to bring back out the darker patches. Julie’s advice was interesting in that she suggested that once the background and main shapes were in place it was better to put the photo away and work on the painting by standing back and reviewing it to decide what to do next rather than sticking slavishly to copying an image. This would result in a freer interpretation and be more enjoyable to produce. Here is my finished painting with the inspirational photo next to it.